You can’t collect a WW2 British or Empire infantry force without getting yourself a Universal Carrier. They’re an iconic vehicle, loved by the men who lived out of them. This nippy little workhorse went everywhere and did everything. Heck, even the Germans used them when they captured them. I bought these two from Warlord, it’s a plastic kit and comes with crew and a few bits of stowage. The kit itself is moderately involved, with more parts than you might expect for such a small vehicle. Everything fitted together snugly, but you’ll want to leave the front panel of the driving compartment loose throughout the build, as once you’ve glued it in you can’t get the driver and commander figures in. Get the vehicle and crew finished separately then insert the crew and glue on the front panel just before you do any final weathering. This will allow you to do things like drybrushing the hull properly without having to work around the crew. I also left off the big tarps on the rear deck until the end so that I could get at all the angles on the rear of the carriers. 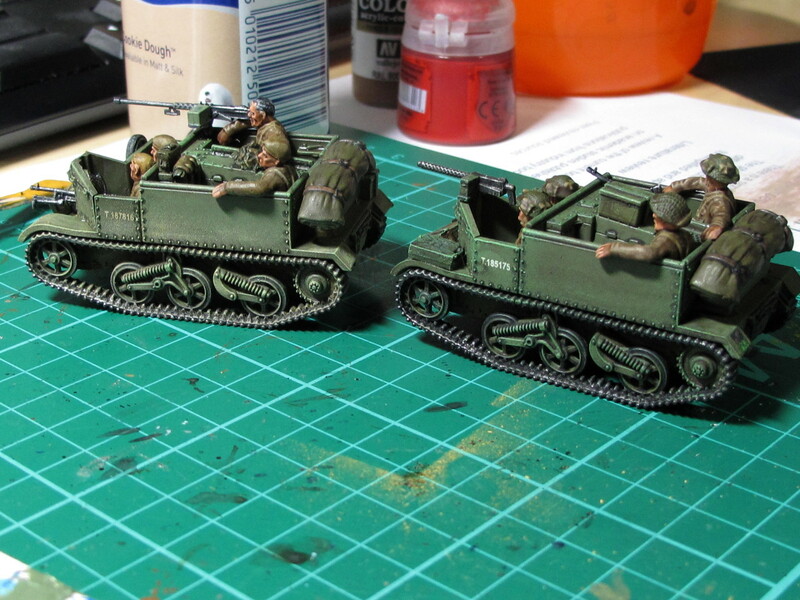 I based my build of these on pictures of real universal carriers in Kiwi service. They seem to have modified them a fair bit, so I didn’t build the kit as it comes. In service they seem to have ripped off everything on side of the running gear, so out went the sides of the front mudguards and the little step half way down the side of the vehicle. A lot of the pictures also the headlights totally boxed in by stowage or absent, so I didn’t fit any. Did they drive at night on red torches or nothing at all? That must have been pretty hairy. 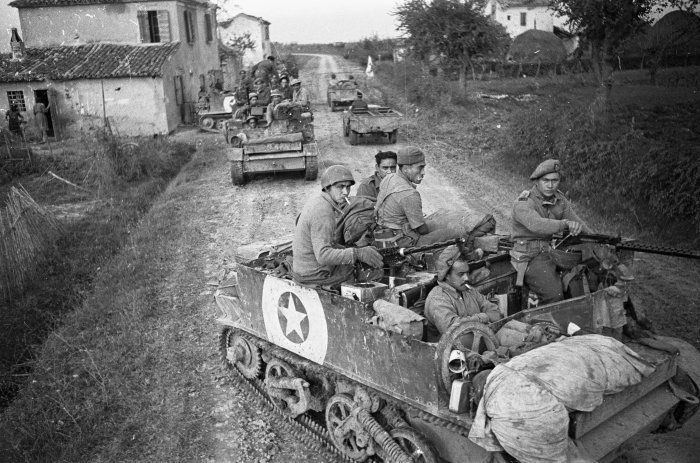 The other main change was that Bren guns seem to have been pretty unpopular armament for a vehicle commonly called a Bren gun carrier! Crews instead scrounged up belt fed guns (who can blame them) and had them welded on wherever they liked. I did likewise and nicked 30cals from an M3 halftrack kit and 50cals off Sherman kits. The stowage was mostly from Warlord’s British stowage kit. A 30cal M1919 replacing a Bren gun. DIY transfers, the unit ID 72 is for 5 Infantry Brigade, 2nd NZ Div. These miniatures are really nice and obviously being designed for this kit fit beautifully, especially the guys lounging around in the back. I did a couple of head swaps from the Warlord British infantry box to get some variation. You get a mix of berets and helmets in the kit, I pooled them so I could have one completely in helmets and one completely in berets or bare-headed (don’t let the CSM see you! ), just to distinguish the two vehicles. I painted these my usual way: spray basecoat, pick out the details then wash, blackline and drybrush up until it looks about right. Actual markings in service seem to have been pretty limited for carriers, so I just went for the unit/divisional sign front and rear, bridging disks and a war department number. Tac signs weren’t used on them from the look of it. The one thing I did do differently this time was use some of the Tamiya weathering powders to put some dust on the lower half of the vehicle. I’m glad I did, they’re awesome. You just smudge the dust colour on with the applicator and brush it out a bit. Job done, and I’ll be using it a lot in future I think. I could probably have gone a bit harder on it if I’m honest, photos from the war show some grubby little carriers getting about. Great job on the carriers. Does warlord have rules for using the 50 cals on them? You mean for Bolt Action? Don’t know. If they don’t, they should as it was a pretty common conversion done in the field.